Dr. Ryan Max Johnson is a General Dentist with a practice limited to the removal of wisdom teeth, placement of implants, and IV sedation. 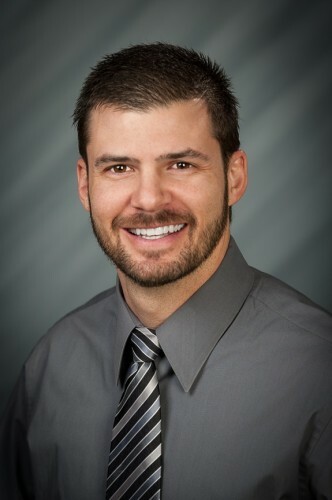 Dr. Johnson completed his undergraduate studies at Brigham Young University. He then received his Doctor of Dental Surgery degree from the University of the Pacific dental school in San Francisco, CA. Following dental school, Dr. Johnson completed a one-year Advanced Education in General Dentistry residency program in the United States Air Force. It was in this residency where he gained the needed training to perform such complex dental procedures as placement of dental implants and extraction of wisdom teeth. Because of this extra training, he is also certified to perform Oral and IV sedation. Dr. Johnson is currently a faculty member for Western Surgical and Sedation, teaching other dentists what he loves, taking out wisdom teeth! When he’s not working, Dr. Johnson loves spending time with his beautiful wife and 3 amazing children. He enjoys racing motorcycles all across Texas and the United States as well as being outdoors as much as he can.